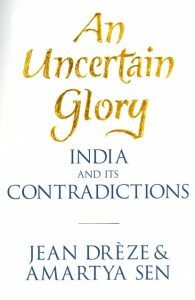 Book Review: AN UNCERTAIN GLORY » Ambassador Fabian’s blog, KP Fabian, Analyst - international political developments, global issues, Indian national issues. For their own reasons, the authors quote only the first two lines (page 1). Is it because they thought that the next two lines might imply a pessimism that they do not share and did not want to project? The reference to the contradictions is apt, as any student of contemporary India might readily agree. What is the glory that is uncertain? Some people may think that it might be a reference to the economic reforms starting from the 1990s. Our authors, gifted with a fine sense of history, are not referring to those reforms. For them, independent India held the promise of development for the people of India as a whole, and especially for the vast majority suffering from poverty, ill health, and illiteracy. The “glory” means pursuing development with vigour and dedication. They believe that such dedication and vigour are absent, engendering much uncertainty about the future. Amartya Sen and Jean Dreze are not just technical economists. Unfortunately, too many of their colleagues get so captivated by the deceptive rigour of an over-mathematicised economics that they forget the human being. Dreze and Sen are refreshingly different. They would never have said that an amount of Rs.33 a day is enough for an Indian to live a normal, non-poor life. They do not look down upon the poor with concealed contempt. For them, human beings in general, but the disadvantaged ones in particular, hold the centre stage. They do not worship the “golden calf” of gross domestic product (GDP) growth. Dreze is one of the best manifestations of good globalisation. Born in Belgium, he came to India in 1979 when he was 20; and 10 years later, he wrote with Sen Hunger and Public Action. Dreze is an Indian citizen. Sen, professor of philosophy and economics at Harvard University, reminds one of Adam Smith, the father of modern economics, who was professor of logic and, later, of moral philosophy at the University of Glasgow. Smith believed until his death that his book The Theory of Moral Sentiments was more important than the better-known and more influential The Wealth of Nations. The discipline of economics as it developed in the West disregarded all moral sentiments and hastily got a divorce from ethics, thereby discarding human compassion. Committing an elementary logical error of mistaking the part for the whole, economists concluded that homo economicus could be considered the whole human being. The course of history might have been different if The Theory of Moral Sentiments had been taken more seriously in Western Europe. Our authors, unlike some others in their profession in the government, are not apologists for the colonialists. They recognise the harm colonialism did to India’s economy. Political freedom gave India the choice to pursue development: the pursuit of development should include reduction of poverty and the “multidimensional” inequality of large sections of the population. The authors do recognise the progress made by India since 1947. In the period from 1900-01 to 1946-47, India’s GDP grew at 0.9 per cent per annum and per capita GDP by 0.1 per cent. In the early post-Independence period, the rate of GDP growth was 3.7 per cent (1950-51 to 1960-61), and 3.4 per cent (1960-61 to 1980-81). The per capita GDP growth rate was 1.2 per cent for the three decades from 1950. The growth rate picked up from 1980. It was 5.2 per cent (1980-81 to 1990-91), 5.9 per cent (1990-91 to 2000-01) and 7.6 per cent (2000-01 to 2010-11). The GDP per capita grew at 3 per cent, 4 per cent, and 6 per cent respectively for the corresponding years. In other words, the rate of growth of per capita GDP in 2000-01 to 2010-11 was 60 times the rate under colonial rule. Life expectancy in India was 32 years in 1952 as against 66 in 2011. Similarly, infant mortality rate (per 1,000 live births) came down from 180 to 44. But, obviously, it is an unforgivably unfinished agenda. Even though India’s recent record of fast economic growth is much celebrated, the “societal reach of economic progress in India has been remarkably limited” (emphasis added). India has been overtaking some other countries in the increase in its real income, but it has been lagging behind them in terms of social indicators. Let us look at South Asia. In 1990, India’s life expectancy at birth was 58, and Bhutan was at the bottom with 53 years. In 2011, India’s at 65 was at the bottom, while Bhutan had risen to 67. Pakistan, too, remains at the bottom with 65 years. Bangladesh has a score of 69 years, and Sri Lanka 75. India is at the bottom for infant immunisation rates (measles), with 74 per cent compared with 99 per cent for Sri Lanka and 96 per cent for Bangladesh. India’s ranking in social indicators consistently came down between 1990 and 2011. The economic reforms started in 1990-91. Obviously, in terms of social indicators, the reforms have made a bad impact, a fact that those who laud the reforms seem to forget. They seem to think that it is more important to reform than to perform. In order to figure out the causes of India’s comparative decline in terms of social indicators, the authors compare Bangladesh with India. The per capita GDP of Bangladesh is half that of India. The democratic institutions in Bangladesh are rather fragile compared with India’s. But, the social indicators in Bangladesh are higher than in India. The authors do recognise the need for an in-depth scrutiny of the causes of Bangladesh’s achievements. But on available evidence they argue that the most important clue is a “the pattern of sustained positive change in gender relations”. Fifty-seven per cent of women in Bangladesh work outside home compared with 29 per cent in India. Bangladesh is ahead of India in the field of public health partly because women there, through non-governmental organisations (NGOs), have been active in this field. As against 55 per cent of Indian households that have no option but to resort to open defecation, the corresponding figure for Bangladesh is 8.4 per cent. Bangladesh has practised a fairly non-coercive family planning programme, leading to a dramatic reduction in fertility in a relatively short time, from seven children a woman in the 1970s to 2.2 in 2011. The replacement level is 2.1. In short, India could learn a good deal from Bangladesh. As we all know, South Asia and sub-Saharan Africa are the most backward regions in the world. It will be illuminating to compare India with countries outside sub-Saharan Africa. The authors choose the 16 poorest countries outside sub-Saharan Africa. India is one of the 16. India tops the list in per capita income among the 16. But in social indicators, India lags behind. Life expectancy at birth is 65 years for India and the average for the rest is 67. Similar conclusions can be derived for infant mortality rate, access to improved sanitation, literacy rate, proportion of undernourished children below five, and child immunisation rates. The lesson to be learnt is that per capita income as an indicator of progress can be most misleading. For India to catch up with the rest of the world, “it needs to focus on public services, social support, and economic redistribution” (emphasis added). Turning to the much-celebrated BRICS (Brazil, Russia, India, China, and South Africa), the authors point out that India’s per capita GDP (adjusted for purchasing power parity) is less than half of China’s, one-third of Brazil’s, and one-fourth of Russia’s. The infant mortality rate for India, at 47 per thousand live births, is almost five times that of Russia at 10. Mean years of schooling in India is two-fifths of Russia’s. The proportion of children with stunted growth in India is five times that of China. Per capita public expenditure on health in India is $29, with $54, $47 and $62 respectively for China, Brazil and Russia. On pages 74 to 76 are tables giving inter-State comparison for 20 States. Gujarat, about which there is some controversy these days, is slightly above the middle for some indicators and nowhere near the top for any. For the human development index, Gujarat comes ninth with a score of 0.520 as against 0.970 for Kerala, which is at the top. Seven States with a combined population of 545 million in 2011 have had poor social indicators and high levels of poverty for a long time. The States are Bihar, Chhattisgarh, Jharkhand, Madhya Pradesh, Odisha, Rajasthan and Uttar Pradesh. Bihar and Jharkhand are no better than Mozambique and Sierra Leone. Indians are obsessed with ranking. Many of them tend to project India’s GDP growth rate and repeat that India is the fastest growing after China. Our authors raise a pertinent question: Growth of what apart from that of GDP? The answer is that the income of the top 20 per cent in the income ladder, mistakenly called “the middle class”, has indeed gone up in the previous decades well beyond what was expected. For the rest of the population, it is a different story. According to National Sample Survey data, the average per capita rural expenditure rose at an excruciatingly low rate of 1 per cent per annum between 1993-94 and 2009-10. Agricultural wage has seen slow growth in the post-reform period. In the 1980s, the wages grew by 5 per cent per annum; in the 1990s by 2 per cent; and virtually zero per cent in the early 2000s. The growth of real wages in other parts of the economy too has been slow. The contrast with China is striking. According to the International Labour Organisation, wages in China rose by 12 per cent a year in the first decade of this century, whereas in India it was 2.5 per cent. Let us look at the non-income factors, which are no less important than the income factors. Here the authors’ findings are shocking. There has been little improvement in India’s nutritional indicators during the last twenty years or so (emphasis added). Nutritional intakes (calorie, protein, micronutrients, almost anything except fat) have decreased (emphasis in the original). Among the major Asian countries, India and Pakistan are at the bottom in literacy rates. The quality of school education, especially in government schools, is low. Even the “top schools” need to improve. For example, only a third of the pupils in class 4 in a “top school” knew who was still living among the four: Mahatma Gandhi, Indira Gandhi, Rajiv Gandhi, and Sonia Gandhi; a few thought that Mahatma Gandhi was still alive. There is an apparent contradiction between the low quality of education in schools and the success scored by many Indians abroad. The authors’ explanation is that it is only a tiny minority of the privileged who do well abroad and that any generalisation based on that on the general quality of education is incorrect. To take one example, in 1901 in Baroda State, male Brahmins had a literacy rate of 73 per cent and female Brahmins 5.6 per cent, whereas the corresponding rates were 1.2 per cent and zero per cent for Dalits. It is the “mutual reinforcement” of different inequalities that creates the enormous disparities in India. Economic inequality tends to be associated with lower health achievements —not just for the poor but also for the population as a whole. Economic inequality tends to increase crime and to undermine civic cooperation and social solidarity. It also gives undue political power to a rich minority with consequential damage to democracy. The continuing hold of caste has been brought out well. A survey of Allahabad shows that the upper castes dominate in the government, the NGOs, the media and other important sectors. In India as a whole, the upper castes with 16 per cent of the population take up 85 per cent of positions as editors. We all can agree that decision-makers in India are innocent of any impatience. They are privileged and do not share the misery of the majority. The self-absorbed elite is incapable of concerning itself with the plight of the rest. The authors raise the question whether democracy in India offers the deprived majority any scope for improvement of their condition. Democracy does offer them the option to “reflect on their own strength” and to demand that the critically important inequalities be rapidly remedied. Will the option be exercised? Gandhi said it in 1948. It is obvious that the Indian elite could have made better use of Gandhi’s talisman. Jean Dreze and Amartya Sen have provided the knowledge base if the elite wants to do that. To go back to Proteus of Verona, will the cloud take away all the glory? It depends on the Indian elite. This book should be made compulsory reading for India’s elite, politicians, bureaucrats, and economists, including those in the Planning Commission who have calculated that Rs.33 a day is enough for an Indian. As a general election approaches, the voters should ask the candidates who seek their votes whether they have read this book.